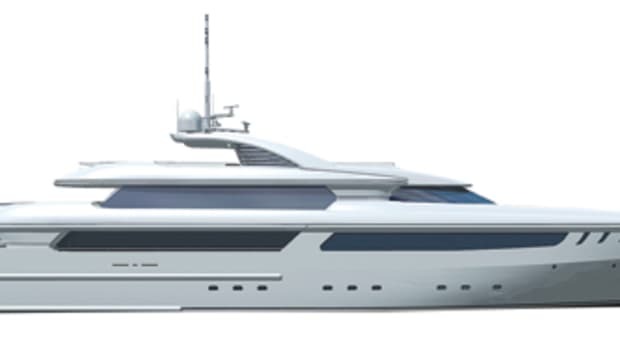 Looking to up his own ante on indulgence afloat, the owner of the 38-meter (125-foot) Man of Steel has commissioned Heesen Yachts to build a 50-meter successor, scheduled for delivery in 2008. 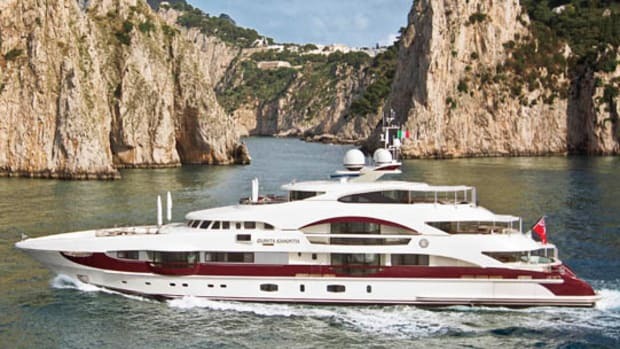 Though she&apos;s far from the biggest motoryacht around, she packs an impressive array of creature comforts into 164 feet. There&apos;s a carefree, convention-defying style in her sweeping raised bulwarks and in the rakish curves of her towering deckhouse. While the look may not suit everyone&apos;s taste, it will surely command attention. As for her creature comforts, let&apos;s start with two hot tubs, one on the sundeck for guests to use and another aft on the bridge deck, in the owner&apos;s private domain. 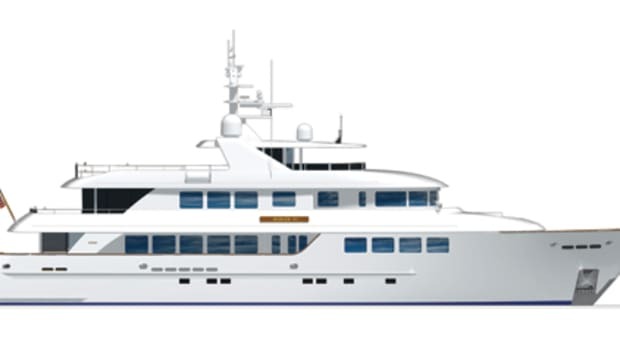 Comprising this elevated sanctuary is a full-beam master suite; occupying nearly half the length of the deckhouse, its focal point is a king-size berth in a circular sleeping area that commands sweeping vistas out over the stern. 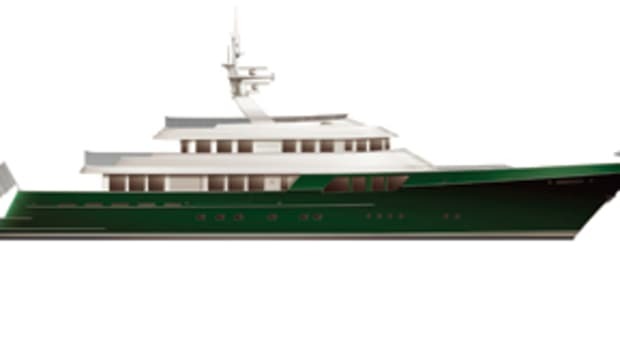 Forward of the wheelhouse is an open-air seating area for guests, and sheltering it is a retractable awning that can be automatically deployed like a convertible top on an automobile. The seating area adjoins a circular space forward that can serve as a touch-and-go helipad. 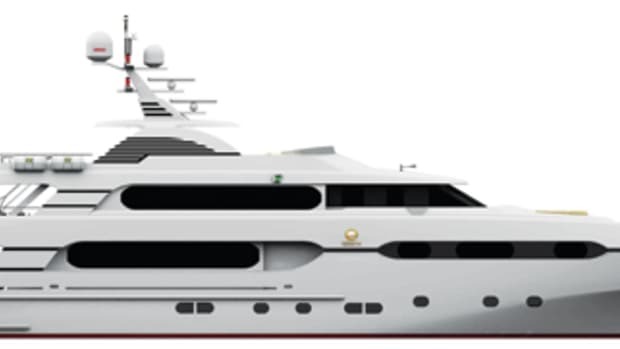 Directly beneath the helipad on the main deck is a full-beam VIP suite with a private balcony that folds out from the side of the hull. On the foredeck, there&apos;s a crane to handle a couple of PWCs and a rescue tender; serious watertoys are stowed in a transom garage on the lower deck, along with dive gear and equipment for other recreational pursuits. Man of Steel is not all about fun and games, though. 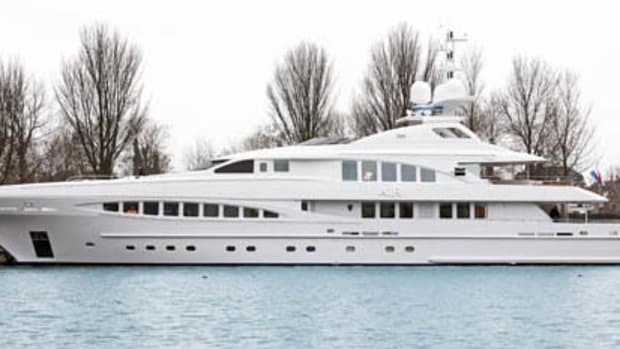 With a range of 6,000 nautical miles at 10 knots (and 3,500 miles at 13 knots), she&apos;s capable of voyaging worldwide on her own bottom, and her steel hull complies with Lloyd&apos;s classification requirements and other related standards. 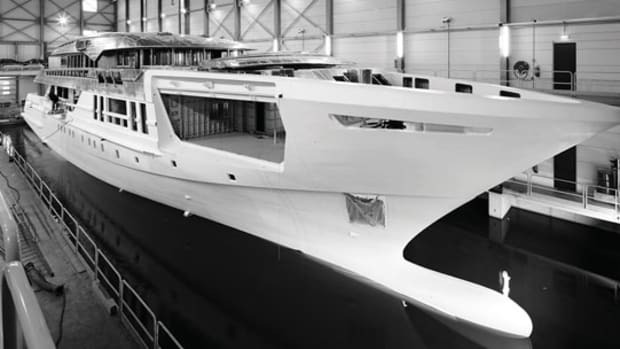 She&apos;s also fitted with a state-of-the-art VT Naiad stabilization system that reduces roll underway and at anchor. 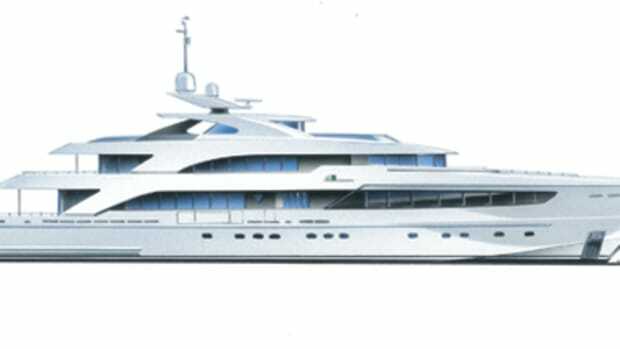 Her acoustic specifications are especially demanding, with a requirement for quieter-than-a-whisper sound levels of 40 to 50 dB-A while at anchor and just 50 to 60 dB-A underway; normal conversation is about 65 dB-A. So while Man of Steel might make a lasting visual impression, audibly you won&apos;t even know she&apos;s there.